We all know the feeling, you’ve just completed a tough session and your legs are aching. Trying to run the next day can be agony. This is where compression socks can come in handy – a good pair can have a positive impact on recovery times and mean that you’re able to run the next day. In this guide, we’ll take a look at some of the best compression socks for runners and highlight exactly what you should be shopping for. When it comes to designing recovery clothing, nobody does it better than 2XU currently do. The 2XU Recovery Compression Sock is without a doubt our favorite sock from their range and it’s worth every penny. Real detail has gone into this sock, both the left and the right socks have been designed with anatomical correctness in mind. The end result is that circulation is enhanced thanks to the new supportive footpads and arch support. Sounds good right? The bigger question is how does it perform in the real world. Thankfully, not only does this sock look good on paper but it’s an outstanding sock to use. Pulling the 2XU on, you immediately feel pressure being applied. However, unlike with other compression socks, there’s not too much pressure applied. Think of this as the Goldie Locks of the compression world. Ventilation is good thanks to some well-placed vents and the socks were comfortable enough to wear all day. 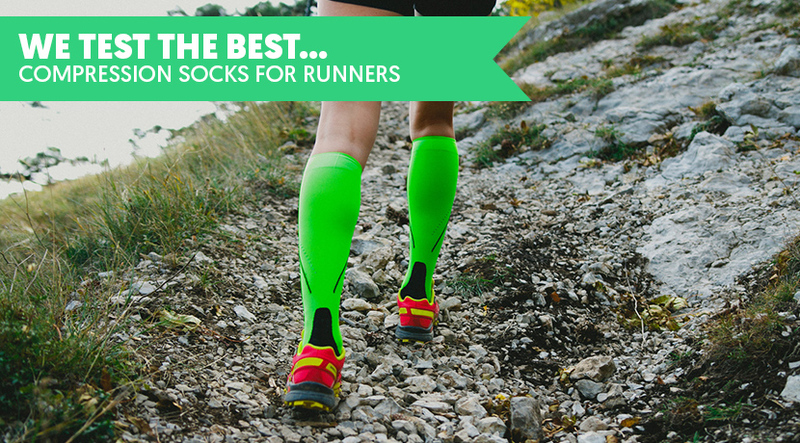 Running in these socks feels good and they’re great for longer runs when legs are tired. If we did have one criticism, it would be that more pressure could be applied to the calf area which would make them even better to use the day after a tough run. The 2XU Hyoptik Reflective Compression Sock is a fantastic running and recovery sock. What we really like about this sock is that it features additional padding in the toe bed which gives it that extra special softness – super important when feet are fatigued. The sock features 3 reflective strips which add an extra layer of visibility when out running in the dark and the antibacterial material means you’re going to avoid nasty fungal infections (as long as you wash after use). With a 12 month care warranty, you can rest assured that this is a quality product with a guarantee to back it up. The 2XU Hyoptik provide a little more compression than 2XU Recovery – this makes them a fantastic choice for those recovery runs on very tired, stiff and aching legs. If you’ve been looking for a compression sock that stands out from the crowd then you’ll certainly want to consider the Vitalsox VT1211. The Silver Drystat technology helps wick sweat away from your feet and prevents the growth of fungus and bacteria. The whole purpose of a compression sock is to help boost circulation and the Vitalsox VT1211 certainly do that. The patented graduated compression 12-20mm Hg is ideal for active recovery and passive recovery. Where this sock really stands out is with the level of midfoot compression that’s provided. Real thought has gone into the design and development of the Mojo Recovery socks. For a relatively unknown brand Mojo have made an impressive compression athletic sock that can keep up with those produced by the big boys. So what’s makes this sock special? Well for a start, the graded compression is excellent with the foot and ankle support comes with a 30mmHg grading which loosens slightly toward the calf to 20mmHg. The end result is a sock that is comfortable enough to run in yet provides enough compression to reduce foot and leg fatigue. The material is great and feels comfortable to wear and even sleep in and breathability is fantastic thanks to the vents built into the upper of the sock. Finally, these socks represent fantastic value for money – if you’re looking to buy your first pair of compression socks or are looking to buy a few pairs for daily use then you’ll certainly want to consider buying a pair or two of these. Zensah Tech+ Compression socks are designed to get you back on your feet following a tough session or injury. Providing an extremely comfortable fit, a seamless toe which helps reduce blisters and hot spots when running and anatomical fit you can be sure that these are socks to really help with your recovery. Extra banding compression is provided on the arch and heel while the graduated compression helps boost circulation throughout the lower leg. What we found to be particularly surprising was just how well the Dayum Well sweat wicking technology worked. Even on the warmest of days, sweat was wicked away from the skin and we weren’t left with puddles in our shoes. Finally, with a choice of 9 colors available, you can be sure to make a statement with your socks! There are 4 main levels of graduated compression and depending choosing the right type is a personal choice based on what you need. If you’re looking for a level of compression that will help to improve circulation without feeling too constrictive then a sock with a compression level of 10-15mmHg is probably about right for you. For runners, this level of compression is about right to use after easy runs where you just want your legs to feel fresh the next day. Socks in the 15-20mmHg range provide all the benefits of light support but with a little bit more pressure. Personally, we like to use this level of compression the night before races. It’s firm enough to really improve circulation and reduce any swelling yet comfortable enough to sleep in without being restless. All the running compression socks on our list fall within this range. With many of the graded compression stockings above, the foot and ankle will have a rating of 30mmHg and then slacken towards the top which is normally around 20mmHg. Socks within this range are ideal for running, recovery, pregnancy, and people who have jobs that demand they’re on their feet all day such as nurses. A moderate support sock will allow you to run without them feeling too restrictive around the calf. After a big race or intense session, sometimes you just need that little extra compression. Socks in the 30-40mmHg range, while extremely tight, will leave your legs feeling so much better the next day. Firm support socks however probably aren’t the best to run in for anything over a 30-minute recovery trot. So in the product reviews above, you may have seen that we bang on about “graduated compression” but you might be wondering what it and more importantly, why is it such a big deal that my socks have it? Graduated compression helps to improve circulation in the legs. The technology is designed to apply a greater amount of pressure on the ankle and upper foot and less pressure through the calf. It offers runners (and anyone who’s on their feet all day) the benefit of improved circulation. Can I Run In Compression Clothing? While research is still being carried out on the benefits of compression stockings for runners, a 2009 study did find some positive benefits for runners. Running performance at the anaerobic (minimum lactate + 1.5 mmolxL) threshold (14.11 vs. 13.90 kmxh, ES: 0.22) and aerobic (minimum lactate + 0.5 mmolxL) thresholds (13.02 vs. 12.74 kmxh, ES: 0.28) was significantly higher using compression stockings. However, the study was quick to conclude that there was no obvious explanation for why and that further research was needed. While signs are promising, it looks like the jury is still out!